Dpinst.exe is a Windows file and is called as driver package installer. It belongs to Microsoft Corporation. This file is stored in c:\windows. Malware programmers spread the malicious application with the name dpinst.exe through the Internet, if the system is affected by this virus the whole system crashes down losing all the data. It is a Windows file and is stored in c:\windows. If you suspect that the system is affected with this virus, check the file location by pressing the combination of keys like ctrl+ALT+DEL and go to the process tab and right click on the dpinst.exe process. If the location is c:\windows your are safe and if it is located in some other location the system is affected by virus. How to remove the dpinst.exe file from system using Comodo Free Antivirus? 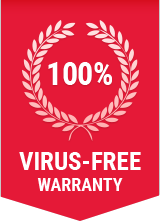 Step l: Download our award-winning Comodo Free Antivirus. Step 8: Comodo Antivirus will remove the dpinst.exe virus from your computer including all other malwares!